“The Nervous System is the most complicated and highly organized of the various systems which make up the human body. It is the mechanism concerned with the correlation and integration of various bodily processes and the reactions and adjustments of the organism to its environment. In addition the cerebral cortex is concerned with conscious life. It may be divided into two parts, central and peripheral. This is from the 1918 Edition which is available, complete with illustrations, on Bartleby HERE. More on Henry Gray on Wikipedia HERE. 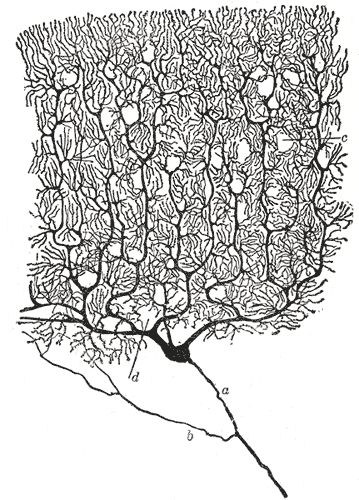 The illustration from Grays 1918 edition is of of a Purkinje cell from the cerebellum.